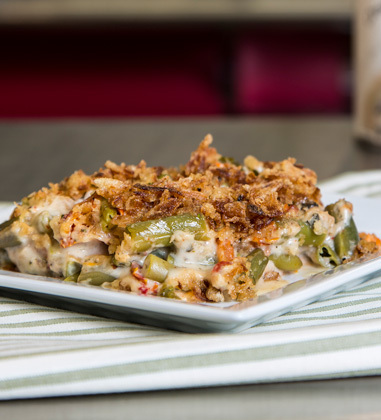 A twist on our classic Green Bean Casserole made by adding roasted red peppers and sundried tomatoes. For a video demonstration please click here. cut green beans, #10 can, drained	 970 oz. 2 ea. 1. Place the drained green beans in a bowl. 2. 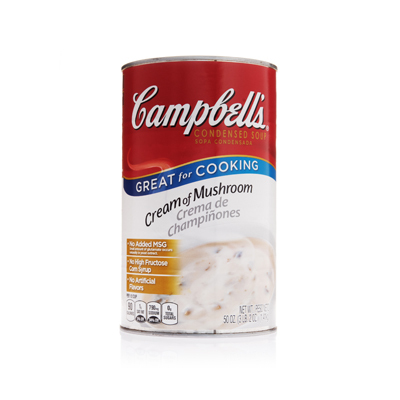 In separate bowl, combine Campbells® Condensed Cream of Mushroom Soup and milk. Whisk until combined. 3. Pour the soup mixture over the green beans. garlic, peeled, roasted, minced	 3 tbsp. 4. Add roasted red peppers, sundried tomatoes, and roasted garlic. Mix well. 5. Pour out into one 2 inch hotel pan and bake at 350 degrees for 1 hour or until the middle is hot. If needed, stir casserole a little while baking to even out the heat distribution. 6. Remove from oven. Top with fried onions. Return to oven. Bake for another 10-15 minutes. Be careful not to burn the fried onions. 7. To Serve: Using a #4 scoop, portion 1 cup onto plate. Serve immediately. cut green beans	 970 oz. 2 ea.